PORTLAND, Ore. (PAI) – A federal administrative law judge has ruled the Fund for the Public Interest broke federal labor law when it fired pro-union phone fundraiser David Neel last November from the fund’s Portland, Ore., call center. In a 28-page ruling, administrative law judge Margaret Brakebusch ordered the Fund to offer Neel full reinstatement and back pay plus interest, which could total around $26,000. 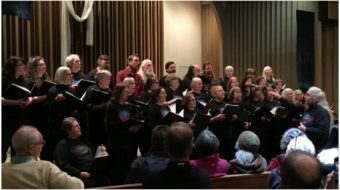 Fund for the Public Interest is the fundraising arm of a national network of groups that includes state PIRGs (Public Interest Research Groups) as well as environmental groups like Environment Oregon, Environment Colorado, and the National Environmental Law Center. The fund signs up members for its affiliated groups using door-to-door and on-street canvassers in 40 states, and then hits them up for additional contributions from call centers in Boston, Sacramento, and Portland. 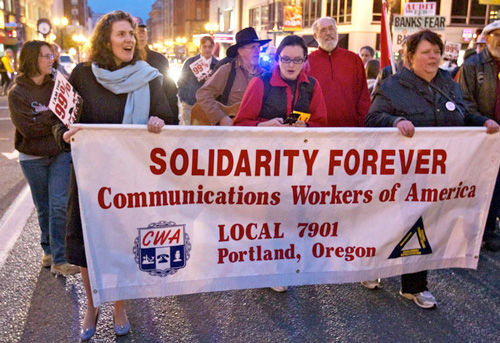 But draconian pay and discipline practices led workers at the Portland call center to join Communications Workers of America (CWA) Local 7901 in November 2011. Two years later, they still have not reached agreement on a first union contract, and in that time, the fund has fired at least a dozen union supporters. Of course, that’s not the same as saying the fund was innocent. Most of the workers were fired for missing a fundraising quota for two consecutive weeks. But union supporters are convinced managers are purposely assigning them tough call lists, tough enough that top fundraisers who never missed a quota in years can be terminated in two weeks’ time. As yet, the union has been unable to prove that managers are tailoring the call lists to get rid of union activists, despite the fact that every worker who initially led the union drive has been fired. If a manager were to come forward with smoking gun evidence, those cases could be reopened, with the fund on the hook for bigger damages. Brakebusch’s decision is based on a 2-day hearing on Aug. 6-7 in Portland, in which both sides presented sworn testimony. Just before the hearing began, the fund offered Neel full back pay – about $23,000 at the time – if he would agree to drop the case. He refused. In the hearing, the fund denied it fired Neel for his union activism, but Brakebusch found fund managers’ testimony to be contradictory and not credible. Neel was one of the fund’s top fundraisers. He had never failed to meet his weekly quota since starting in Spring 2011, and he had earned the fund’s top rate of $14.50 an hour since January 2012. But he was also a thorn in management’s side. After workers voted 19-5 to unionize, Neel was elected steward and a member of the contract bargaining team. 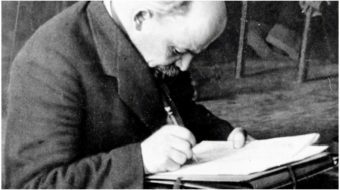 At work, he gave out red teddy bears with union buttons attached for co-workers to display at their desks. On Thursdays, he would bring a 5-foot stuffed alligator toy to the call center as part of a silent protest against the policy of firing workers for the second week of missed quota. 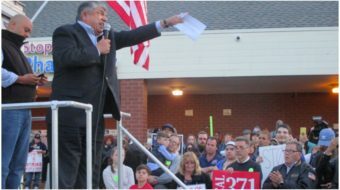 When the fund terminated co-worker Ben Woodhouse on June 14, 2012, it was Neel who stood up and announced that co-workers were walking out to protest the “unfair” firing. He led another walkout two weeks later, when 9-year employee Cortina Robinson was fired. In the hearing, fund managers testified they fired Neel for veering from the official phone script, failing to “triple confirm” pledges, and misreporting the outcome of phone calls. Neel denied the allegations. But it didn’t matter; Brakebusch found those stated reasons were pretexts. Fund manager Kate Fielding testified she listened to Neel’s calls for two straight hours, overheard as many as eight policy violations, and wrote them down on a piece of scrap paper, not the monitoring forms managers usually use. Two days later, her boss Raley fired Neel by phone, told him not to come into the office, and overnighted his personal belongings to him. Normally, when fund call center directors hear a caller make a mistake, they intervene soon afterward to correct it. But Fielding, Brakebusch noted, made no attempt to stop Neel or to intervene in any way. She let him complete his shift, and said nothing to him about the alleged mistakes. Fund managers made no attempt to investigate, or even ask Neel for clarification about the allegedly “egregious” interactions. And Fund records showed that other workers were repeatedly counseled, and not fired, for making the same mistakes Neel was alleged to have made. 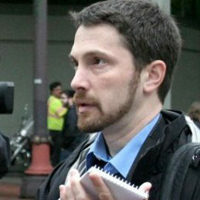 During the hearing, the fund’s attorney also argued the fund shouldn’t have to reinstate Neel even if it was found he was fired unlawfully, because he was quoted in the Portland Mercury newspaper making a statement that harmed the fund’s reputation and relationship with partner organizations. The fund has until Nov. 22 to appeal Brakebusch’s decision.